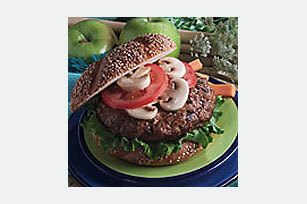 Seasoned ground turkey patties are pan-fried and topped with sautéed mushrooms for juicy, flavorful burgers the whole family will enjoy. Mix turkey, parsley, Worcestershire sauce and onion salt in large bowl. Shape into 4 (4-inch) patties; set aside. Melt butter in large skillet on medium heat. Add mushrooms; cook and stir 2 to 3 minutes or until tender. Remove mushrooms from skillet; cover to keep warm. Add patties to skillet; cook on medium heat 12 to 14 minutes or until cooked through, turning occasionally. Serve in buns; top with mushrooms. Toast buns before filling with turkey burgers.